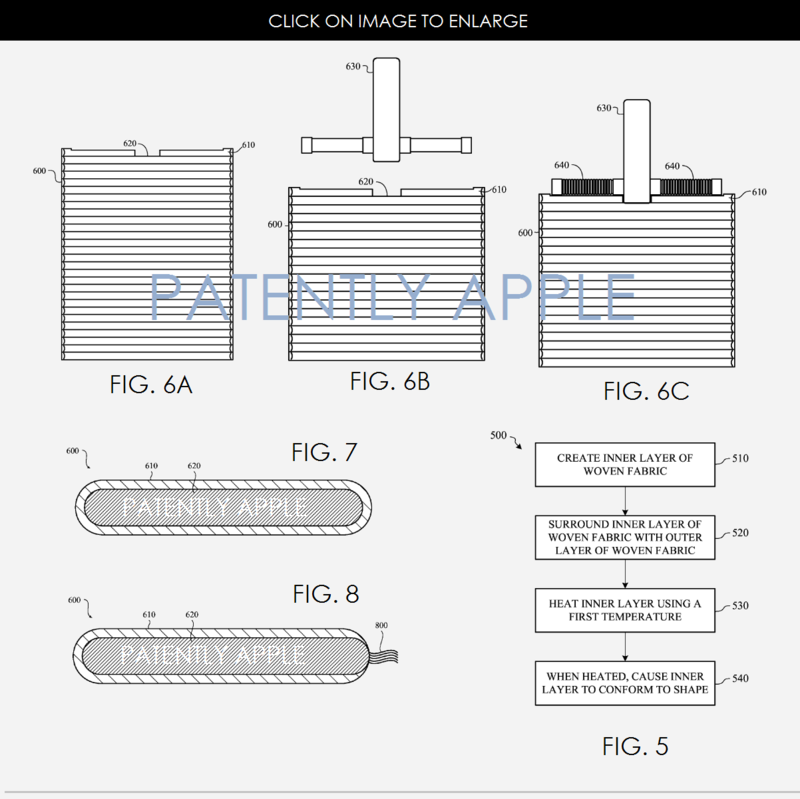 A new Apple patent application published today by the U.S. Patent & Trademark Office (USPTO) reveals how the Cupertino giant created the Apple Watch bands, including the one for the Apple Watch Sport. 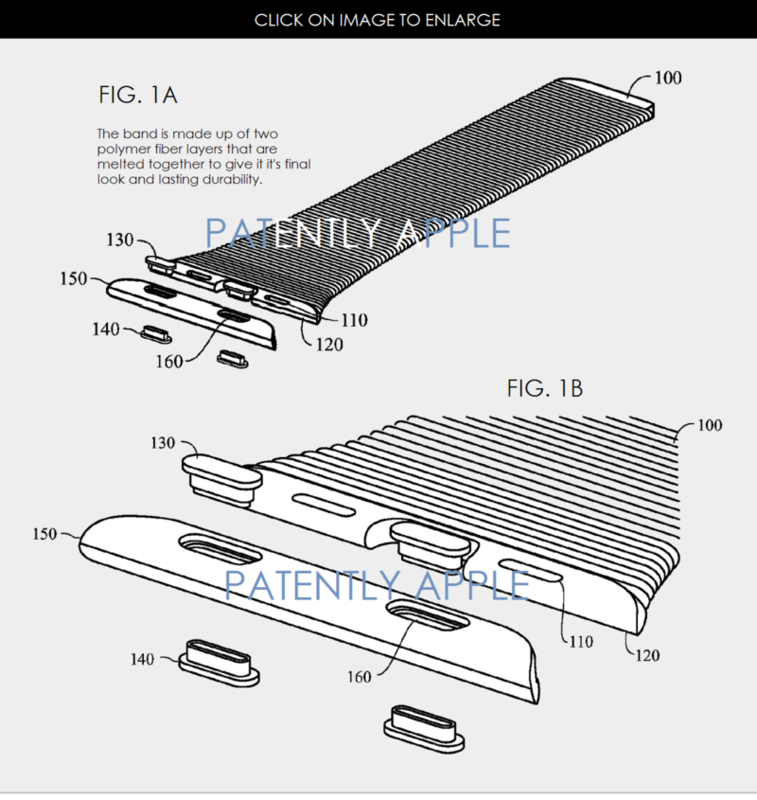 PatentlyApple notes that Apple’s newly designed method for woven fabric band, which contains polymers and includes two different layers of materials, could later be extended to create purse straps and articles of clothing. Apple details that the woven fabric band comprises an inner layer having a first temperature melting point and an outer layer having a higher, second temperature melting point. When heat, having the first temperature, is applied to the woven fabric band, the inner layer of the woven fabric band melts or becomes more malleable while the outer layer remains in its original state. When the inner layer melts, the inner layer conforms to a first shape. As a result of the inner layer conforming to the first shape, the outer layer also conforms to the same shape. The filing notes that although the term fabric is used herein, it is contemplated that the embodiments and methods described herein may be applied to various materials that can be woven together. It is also contemplated that the material, when woven together, may be cut, manufactured or manipulated into various shapes, articles and objects having varying dimensions. Non-limiting examples of the fabric may include nylon and other such polymers. The woven fabric, or portions of the woven fabric, may be heated to a melting point (e.g., a point at which the heated portion melts). When the woven fabric is melted, the melted portion may be manipulated or formed into various shapes, protrusions, depressions, graphics and the like. Apple’s patent FIG. 7 illustrates a cross-sectional view of a woven fabric band. Apple notes that the temperature melting point of the outer layer may be 220 degrees Celsius while the temperature melting point of the inner layer may be 110 degrees Celsius. While Apple’s filing doesn’t reveal the type of polymers used for the creation of these bands, it’s a known fact that Apple uses Fluoroelastomer for the Apple Watch Sport.